Diageo’s eight Game of Thrones single malts are set to arrive in Europe next month ahead of the show’s final season. The collection was released in the US in November, and has been rolling out in Canada and global travel retail this month. Their introduction follows the October 2018 launch of Johnnie Walker White Walker, a blended Scotch inspired by the show’s ‘most enigmatic and feared characters’. The eight malts – each named after one of the Great Houses of Westeros and the Night’s Watch – are already available to pre-order through Amazon, The Whisky Exchange and Master of Malt, ahead of their release from 19 February. Some retailers have already sold out of several lines through pre-ordering, although further bottles will be made available in the coming weeks. Six of the whiskies are new expressions, with the exception of Cardhu Gold Reserve and Royal Lochnagar 12 Year Old, which are already available in the UK as expressions outwith the GOT range. Game of Thrones season eight, the show’s final season, will be aired on HBO in April. 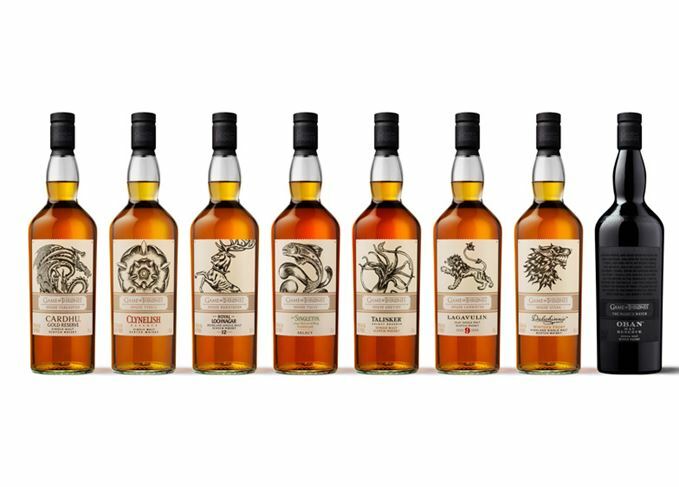 Read Scotchwhisky.com editor Becky Paskin’s reviews of the Game of Thrones whiskies. The collection of Scotch whiskies will ‘honor’ the Great Houses of the Seven Kingdoms. The blended Scotch has partnered with HBO to create a new Game of Thrones themed whisky. The Game of Thrones-themed blended whisky will be available globally from this month.